"A great entry to model railroading"
Kato makes the best locomotives in the business in my opinion. 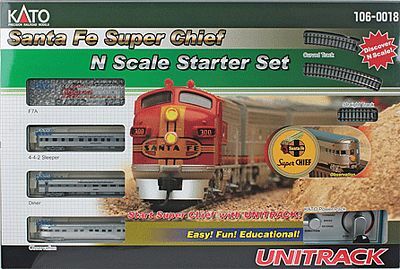 You will be delighted with this starter set containing everything you need to begin this wonderful hobby. The Kato Unitrack is easy to assemble, and, more importantly, disassemble without damaging the rail joiners. Assembly is simple and fast. The passenger cars are 85 scale feet so the Unitrack curves are a 24 inch diameter. The observation car has 3 lights on the rear. The F7A has lighted road numbers as well as 2 head lights. You can expand your railroad by adding additional Unitrack products. NOTE: If you want this set for the rolling stock and controller for your already existing layout, you should know that the Kato controller does not have an AC output for accessories. You may, however, attach remote switch motor controls for Unitrack turnouts to it. Also, it has no off switch. You may cut power to the track in the Brake position, but the power light remains on. You must disconnect the power cord to cut power to the unit.